The weekend after the International break is usually full of surprizes, let’s see if we can make some money in gameweek four. Huesca will play their first ever La Liga home game after playing three consecutive away matches. The newcomers suffered their first defeat of the season against defending champions, Barcelona. Leo Franco’s men made a dream debut in the top flight of Spanish football where they gained four points in their first two games. Rayo Vallecano lost both of their matches and their last game was postponed due to stadium issues. Huesca have won all three of their last home fixtures against Vallecano. There’s plenty of value on the home win and Huesca have showed they are here to compete, get on. Atletico Madrid play host to Eibar in Saturday’s early kick off, with Diego Simeone’s men determined to bounce back to winning ways following their 2-0 loss at Celta Vigo last time out. Atleti are under pressure to improve. After sharing the spoils with Valencia on the opening round, they were put in back-to-back sloppy performances against Vallecano and Celta Vigo, which has put question marks on the Argentine’s defensive tactics. Atletico Madrid have too much quality and I’m backing them to return to winning ways. 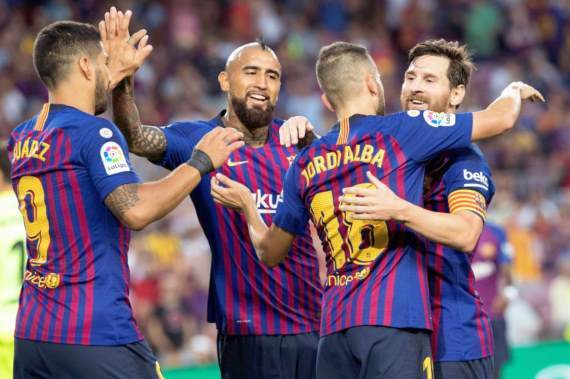 Barcelona are about to make one of the toughest trips in La Liga this Saturday when they travel to San Sebastian to take on Real Sociedad in their bid of claiming four wins in a row. The Blaugrana have been almost impeccable since Ernesto Valverde took charge, losing just one league game. The atmosphere in the dressing room can hardly be better for Valverde’s side, especially after thrashing Huesca 8-2 in their last game. The hosts have been blowing hot and cold so far this season, with a win, draw and a defeat to their name, in the three matches played. Sociedad have always been a tricky opposition for any team at the Anoeta stadium. However, Barca have won their last five meetings against the hosts. Back the away side to Win and Both Teams to Score at 33/10. Valencia are winless in the league so far this season with two draws and a defeat. Marcelino’s men need to find their rhythm quickly as they will also be playing in the Champions League this month. Los Che’s new frontline trio of Kevin Gameiro, Michy Batshuayi and Denis Cheryshev have just one goal between them. Real Betis scored their first goal of the season when they beat 10-men Sevilla 1-0 in the derby last time out. Quique Setien’s men haven’t created much chances upfront, but they face a very shaky Valencia defence that has been leaking in goals, conceding five from the three matches played. It’s hard to pick a winner in a match like this, so get on Both Teams to Score here at 13/20. Athletic Bilbao come from a lengthy two-week break after their match against Vallecano was postponed. The Lions were left disappointed on matchday two after they gave away a 2-0 lead against newly-promoted Huesca. Real Madrid come into this game with a 100%-win record. Goalkeeper Thibaut Courtois made his debut in their 4-1 win over Leganes. Karim Benzema is in fine form, with the Frenchman scoring a brace in each of the last two league games. These sides shared the spoils in both of their league fixtures in the previous campaign. Prior to that, Real Madrid had won four in a row. At 11/20, get on Real Madrid to win and include them in all bets. Girona were one of the most pleasant surprises of La Liga in the previous campaign, but they are clearly finding it hard to cope without Pablo Machin. However, the Catalan club caused a major upset when registering their maiden victory against Villarreal in their turf. Celta Vigo, who were winless in pre-season and drew their opening fixture, have shocked everyone with back-to-back wins over Levante and Atletico Madrid. Head-to-head points in the direction of the home team as they took four points from the visitors last season. I’ll back against the stats here and lean towards the away side to get their first La Liga victory against the hosts. Back Celta Vigo to make it three wins in a row.